KIGALI , Nov 12 2013 (IPS) - When Rwandan designer Colombe Ituze Ndutiye began drawing at the age of six, she thought she would grow up to be a cartoonist. But now at the age of 25 she has the distinction of being the first Rwandan to own her own fashion label, “INCO icyusa”, and was one of 10 local designers who showed off their creations on the runway at the second Kigali Fashion Week on Nov. 8. “I wanted it to be something young and more classic, but I added traditional accessories to combine the two very different cultures,” Ndutiye tells IPS of her new collection, Wild Identity. “Normally, when we have those traditional accessories it’s just for a wedding. They symbolise a Rwandan theme. Having it mixed with western culture, for me, it was something wild,” says Ndutiye, who first became intrigued by fashion design when she met a Belgium designer in Rwanda. Rwanda’s economy has come a long way since the 1994 genocide that resulted in the deaths of almost one million people in less than 100 days. Before 1994, the country had a “small and uncompetitive” industrial sector, which manufactured soap, textiles, small-scale beverages, furniture and plastic goods. But now the government hopes it will become the Singapore of Africa. “Rwanda hopes to emulate and replicate Singapore’s ICT feat in Africa by creating favourable ICT policies that lay the groundwork for its ICT sector,” an October economic report by South African-based research and strategy firm Consultancy Africa Intelligence states. According to the report, post-genocide Rwanda has achieved a lot in its Information and Communications Technology sector. And there is hope that Rwanda could become just as successful with its fashion. 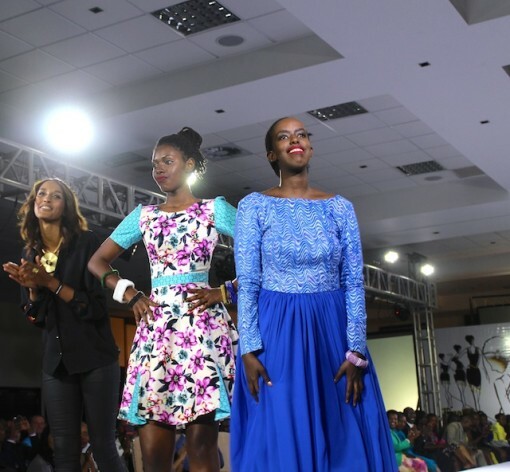 Local company House of Fashion was established almost two years ago to support and promote the Rwandan industry. House of Fasion’s head John Bunyeshuli says Rwandans have a “subtle” style, with the “high end” of the population able to travel to Europe to buy clothes. “But the middle [income sector], mostly go to markets [that sell] secondhand clothes,” Bunyeshuli tells IPS. He says there is a perception here that fashion is not for the serious minded. “Rwanda is a new country, we’re still catching up. Yes, people here do fashion shows, but they take it as a luxury,” Bunyeshuli says. LDJ Productions, the company that has been running New York Fashion Week (NYFW) for the past decade, say there is certainly potential in Rwanda for a booming rag trade. Founder and chief executive officer Laurie DeJong has been mentoring Ndutiye for the past two years after hearing about her through the Peace Through Business (PTB) programme, an initiative of the U.S.-based non-profit Institute for Economic Empowerment of Women. The programme involves pairing western female entrepreneurs with women in Afghanistan and Rwanda in order to empower them. Although Ndutiye was not picked for the programme, PTB’s founder connected DeJong with the African designer. “Fashion is one of the biggest industries in the world,” DeJong tells IPS. “New York Fashion Week is one of the biggest events in New York City, it brings in the most income of any event in New York City. I think the potential for the revenue for this country [Rwanda] is just as huge,” she says. In the lead-up to Kigali Fashion Week’s Nov. 8 evening show, LDJ helped with fittings, building the catwalk, and installing lights and sound. They also organised marketing and business workshops and a photo shoot for each designer. Upcoming Rwandan designer Michaella Rugwizangoga sees a gap in the local market and plans to continue working here on her line Chicissime, which she launched last year. “[The West African fashion industry] is much older. They have more skills and the country where I was born [Côte d’Ivoire] is on the sea so it’s not a land-locked country like Rwanda, so there’s much more choice of fabric,” Rugwizangoga tells IPS. But Rwanda currently lacks a local fashion school. And Belgian-born Candy Basomingera, who partnered with Sonia Mugabo to design the women’s range, Afrikana Exquisiteness, would love to learn more about the industry. “There’s no fashion school here…You can learn on the job but it will never be as good as if you went to a school where they teach you the basics and you go for internships with big fashion houses,” Basomingera, who is planning to start selling her range online soon, tells IPS. Basomingera, who is part Belgian Congolese and part Rwandan, worked in public health but when her contract ended a year ago, she decided to venture into fashion. She says she would love it if Rwandan designers, models, tailors and photographers were able to travel aboard and be exposed to international fashion industries. Her dream may come true. There is a possibility that some Rwandan fashion designers may go to NYFW next year. And there are plans to bring international sponsors onboard for the third Kigali Fashion Week. But before that there will be a mini Fashion Week in May with a fashion school involving industry figures from the U.S., Canada and the United Kingdom. The long-term goal is to construct Rwanda’s first school of the arts with the House of Fashion.